Order an iPhone 5 today and you could get it by the weekend. Shipping times for the iPhone 5 have improved again as Apple continues to catch up with the handset’s initial demand. 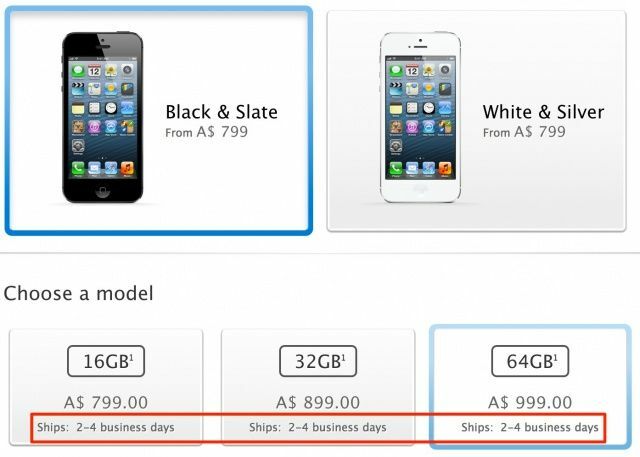 Just 7 days after shipping times dropped to one week, the Apple online store now states that new iPhone 5 orders will be dispatched in just 2-4 business days. At least, that’s the case if you live in Australia. The new shipping times are yet to make their way to Apple stores around the world, but we’re expecting them to do so later on today. Australians also saw the one-week shipping times first on November 26, but it didn’t take long for them to appear in other countries. The new shipping times apply to both the black and white iPhone 5 models in all storage capacities. And with just a 2-4 day wait, you could order a new iPhone 5 today and there’s a good chance you’ll receive it by the weekend. That’s great news for those of you purchasing the handset as a Christmas gift, who were worried it might not arrive before Santa does. Unfortunately, shipping times for the iPad mini — which is expected to be a big hit this holiday season — are yet to improve at all. A two-week delay was imposed on the device shortly after it launched back in October, and that still stands today.